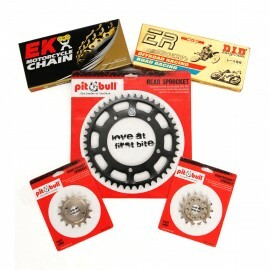 Pit Bull's Chain and Sprocket Kit combines a hardcoat anodized rear sprocket with a countershaft t..
Case hardened, nickel plated steel countershaft. Lightening holes are added wherever possible for..
Case hardened, nickel plated steel countershaft. *NOTE Use a smaller front sprocket for more.. Pit Bull Hard Anodized Aluminum Alloy Rear Sprockets. 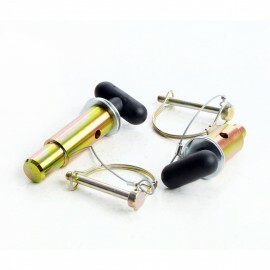 Manufactured to exact tolerances from T7075.. Pit Bull Hard Anodized Aluminum Alloy Rear Sprockets. Manufactured to exact tolerances from T..